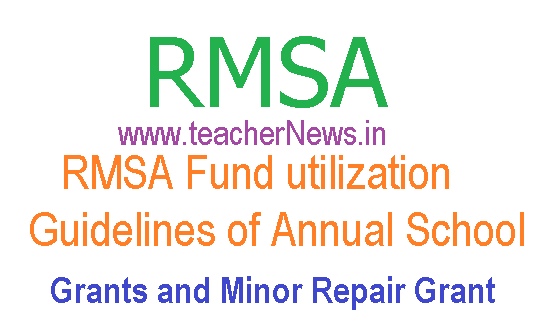 RMSA Fund utilization guidelines of Annual School Grants and Minor Repair Grant 2015-16 : Suggestive Guidelines on utilization of the Annual School Grants and Minor Repair Grant under AWP &B of RMSA for year The Annual School Grants @Rs. 50,000/- (A Rs. 40,000. 00 in total and Minor Repair Grant @ Rs. 10,000.00) under AWP&B 2015-16 of RMSA, Andhra Pradesh are being released to the School Management and Development Committees (SMDCs) of Govt. Secondary and Higher Secondary (having secondary section) schools maintaining A/C in various Banks by way of Bank transfer from State Office of RMSA, AP. The Grants are released to those schools who submitted the utilization the school grants released during 2014-15.
b. Newspapers, periodicals/journals/magazines etc on need basis. d. Equipment for Sports, music, dance, painting, culture etc. h. Sanitary & Other fittings, Furniture and fixtures etc. 4. Sanitation and ICT : ( Rs. 5 lakh per school) To meet the expenditure of Sanitation worker not exceed Rs. 1000/- may be altered. To meet the Allowance of Rs. 500/- for teachers who allotted and to look after the activities of ICT in the school. 5. Need Based works and Permission authority: Other Expenditure time to time on need based : The suggestive items on need based to meet the expenditure with prior permission should be ta ken from the District Education Officer for limitation of Rs. 5000/ — and Regional Joint Director is competent to provide permission upto 10000/- on detailed report and outcomes should be submitted by the SMDC chairman (Mead Master) along with resolution copy so as to take the decision by the competent authorities. (a) Proposal of works to be done through the specific grant with priority of works. Process for implementation of the works including time frame should also be clearly mentioned in their resolution. (b) Resolution on community contribution & arrangement of Panchayat contribution etc either cash or kinds to support the grants are also required to be mentioned. Process for maintenance of records, registers & vouchers etc against the each work. Submission of the utilization certificate of the grants to the District Programme Co-ordinator, RMSA or Dy. Educational Officer of School concerned in the specified formats with in stipulated time frame. 1.he SMDCs will have to maintain a separate cash book for recording the financial transaction of the grants separately under RMSA programmes. 2. SMDCs will have to up-date their Bank Passbook immediate after receiving information on Bank transfer of the fund and the same should be recorded in the cash book in detail. 3. In case of the problems related to credit in the SMDCs A/C & other transacting process of the bank, the SMDCs should inform the District Programme Co-ordinator, RMSA concerned immediately. 4.The SMDCs will have to complete a II works to be implemented through the grants within the stipulated period. 5. After implementation of every work, cash book should be updated mentioning voucher numbers etc. 6.The SMDCs must be submitted the utilization certificate of the school grants a long with photocopies of vouchers within 10 days from utilization of the grants to the concerned District Programme Co-ordinator, RMSA or Dy. Educational Officer of Schools in the specified format. 7. The SMDC will be legally duty bound for utilization of the g rants as per guideline. Disciplinary action will also be initiated against the defaulter SMDC and HM/ Principal of the school. For effective implementation and better completion of the works, contributions of the Govt./ PRI/ Comm unity/ Private sector (either through cash or kinds) are a Iways encouraged and the SMDCs can receive such contributions. The data its of contributions should be donated systematically and the contributions are required to be mentioned in the format for proposal of works. To ensure receipt of the grants by the SMDCs timely, the DPCs or ISs will have to co- ordinate with the nodal Bank in the district. In case of error found in the Bank details along within the list of schools, the DPCs or Issue Id inform the Mission Director, RMSA, Andhra Pradesh immediately. 3. The RJD, DPC (DEO) and Dy. E. 0. And other officials of RMSA will have to monitor the proper and timely utilization of the g rants as per guideline during their school visit. The DPC (DEO) and Dy.E.0.s are also to ensure distribution of the guidelines & formats related to proposal as well as utilization of the grants and submission of utilization through the specified format to the Mission Director, RMSA, Andhra Pradesh. Guidelines on utilization of the Annual School Grants and Minor Repair Grant under AWP &B of RMSA for year The Annual School Grants @Rs. 50,000/- (A Rs. 40,000. 00 in total and Minor Repair Grant @ Rs. 10,000.00) under AWP&B 2015-16 of RMSA 2015-16.